On December 4, 2018, the Vatican City Philatelic and Numismatic Office issued a commemorative coin for the canonization of Pope Paul VI and a commemorative envelope for the 50th anniversary of Padre Pio’s death, Vatican News reported. 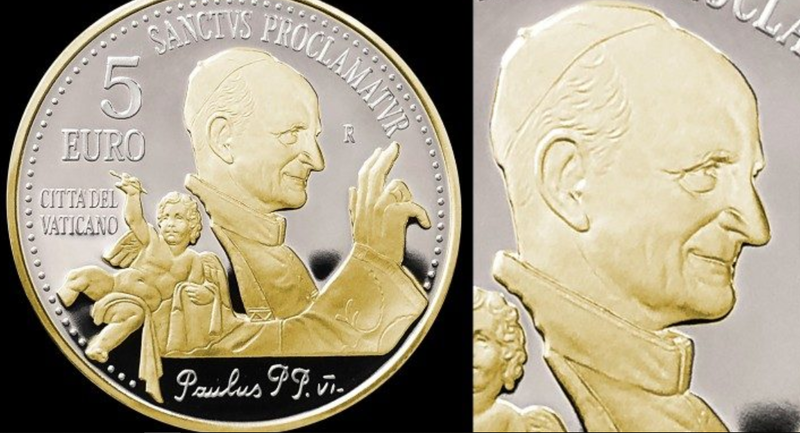 To commemorate the canonization of Pope Montini, on October 14, a special silver coin worth 5 euros with gold-plated reliefs was issued by the Vatican with a circulation of 1500 copies. The fifty years since the death of St. Padre Pio of Pietrelcina are celebrated by the creation of a philatelic-numismatic envelope, which contains a bi-metallic commemorative 2-euro coin and a special stamp. The Vatican Philatelic and Numismatic Office also offers collectors a commemorative numismatic volume that includes the two euro coins issued during the year 2017 and dedicated to the 1950th anniversary of the martyrdom of the Apostles Peter and Paul and the centenary of the apparitions of Fatima. The volume is available either in full version, with coins, or in empty version to complete. Finally, the traditional annual volume of all philatelic production of the Vatican Post in 2018 is also available in Italian, French, English, and German.